Nationwide, housing prices are down 30 percent on average—even down 55 percent in some locales. With the number of foreclosed homes on the market, it’s no longer impossible to find well-priced properties by the beach. Miami—a city known for its great beaches and lively nightlife—has been included in CNN’s top ten cities for home buyers, and it’s no wonder: owning a quaint stucco cottage in this dynamic city now costs less than renting! Other beach- and bayfront properties are available at very low prices in other beach communities, where they are targeted for “second-homers” and snowbirds who find fine white sand and great beaches irresistible. With a seaside atmosphere as the lure, and great prices as the hook, buyers are falling for beach living, and getting great deals in the process. Aside from low prices, there is another factor which encourages home buying now: interest rates are at a 40-year low. Averaging just shy of 4.3 percent for a 30-year fixed-rate mortgage (as of this writing), the cost of financing a home purchase is much lower now than it was just a few years ago. This means a great deal for middle-income families, who are finding that with low interest rates, the beach home of their dreams is becoming more financially feasible. Rates can’t stay this low forever, so buyers need to hurry to take advantage of this once-in-a-lifetime affordability. Would you like a beachfront property in Fort Lauderdale, imagining a leisurely life parasailing or snorkeling right in front of your home? Or perhaps you’d prefer a condo on the coast of California? Prices for condominiums in both of these locations have gone down drastically, and if you pay with cash, you can even get a better deal. However, once the market goes back up (and some analysts are seeing rising trends), sales volume increases, and at that point inventory levels will come down dramatically. The longer you postpone buying a home, the smaller your choices will become, and your chances of finding an affordable dream home may vanish. Properties located in cities with warm weather and beaches, like sunny Florida, are bound to appreciate in value in the future, given all the perks that come with them: white sand beaches, temperate climate, and a variety of water sports and other entertainment opportunities. And what sustains the value of these properties also drives their demand, meaning when the market picks up, it will pick up fast. Buyers are sure to swamp these locations when confidence in the marketplace returns, so why not buy low and make the best financial move? Forces are conspiring to make it easier to own that dream home than its ever been. So take the hint, and check out the prices in your dream beachfront community. You may be pleasantly surprised. Short Sales: What to Offer. Past events can be a good indicator of what the future may have in store. The Sussex County MLS is showing 130 current Active/Available Short Sales. What do we see when we compare Short Sale List Price to Short Sale Sales Price? We find that the banks are more stingy than private home sellers. The average private party seller is selling for about 9% below asking price, the banks on average are only taking a little more than 2% off the asking price. Add to that the fact that nearly half of the short sales were at 100% of the asking price and you will see there is significantly more bargaining room when dealing with a private seller. Here’s a quick update on this years “In-Town” Rehoboth Beach Condo Sales. From January 1 – August 7 2010 there have been a total of 20 In Town “Walk to the Beach” condos sold. Lowest sale price $225,000 1BR/1BA in The Ark six blocks to the beach. Highest sale price $900,000 2BR/2BA 527 North Boardwalk in the Henlopen Hotel with Ocean views. 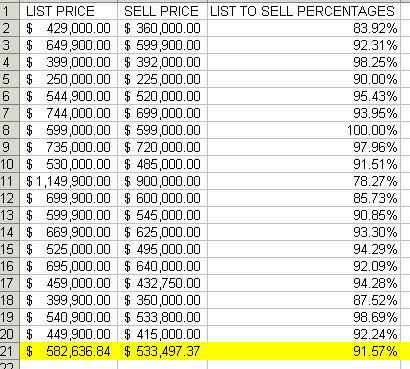 The lowest list to sell percentage was 78.27% Which means a buyer got more than 20% off the list price. The highest was 100% which means the seller did not back down on their list price. Please do not come to Rehoboth Beach expecting 50% off on your condo purchase because the market is atrocious in Florida. Your average buyer here is getting just over 8% off list price on their condo purchase. Data for this chart was pulled from the Sussex County MLS. 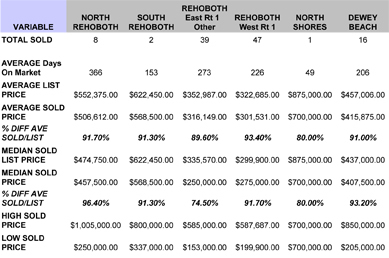 This analysis does not include anything but SOLD condos placed in the “IN TOWN” Rehoboth Beach category by Sussex County REALTORS. 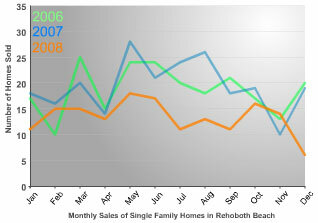 The number of TOTAL condos sold in Rehoboth Beach Delaware is significantly higher. 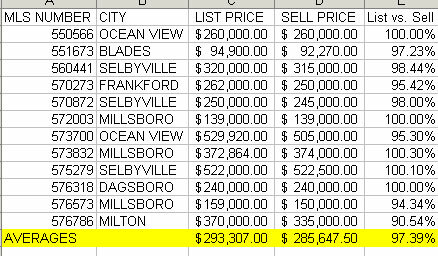 So, what has sold (closed) in the last 30 days in Rehoboth Beach Delaware? April 26 – May 26 2010. 38 total closed deals. Eight land lease mobile homes. Four new construction entry level priced single family homes. Six pre-owned single family homes in upscale neighborhoods. Ten in-town properties priced over a million. Closed deals were typically written up a minimum of a month prior to settlement and many as long as three months ago. Homes currently under contract gives a better picture of current market activity and for the same time period (April 26 – May 26 2010.) there were 102 pending deals written. 14 Mobile Homes on leased ground. I have also found that Zillow does not seem to take into account the distance to the beach or bay when determining it’s zestimates. In the real world every block closer to the beach a property is can equal hundreds of thousands of dollars of price difference. Snooze and you may lose. While it’s true that the real estate market is a real mess right now the best deals are moving like hotcakes. I lost two deals this week to clients who did not pull the trigger quickly enough and were beaten to the settlement table by well prepared snipers. If you think a particular house is a spectacular deal there is a good chance that someone else is thinking the same thing. The sales I lost out on were both on the market less than two weeks. These stats are very general in nature. They do not take into account the number of bedrooms, baths, square footage, waterviews or even the fact that there may be a lease expiring on the property in the near future as is common in Dewey Beach properties owned by “Rehoboth by the Sea”. If you enjoy crunching real estate related numbers give me a call for more in-depth data. Hottest Selling Community: Rehoboth Beach Yacht and Country Club with 15 total sales. Hottest Selling Community: Summercrest with 12 sales closely followed by RBYCC with 11 total sales. Hottest Selling Community: Rehoboth Beach Yacht and Country Club with 24 sales. 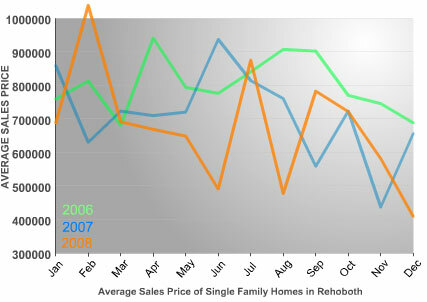 This chart shows the number of single family homes sold in Rehoboth Beach Delaware by month for 2006, 2007 and 2008.